Verrines become more and more fashionable in France and abroad. But it doesn’t mean that the food must be fancy. Verrines can contain fusion food or molecular cooking; nevertheless old style recipes can also be adapted to fit in these little glasses. For example the following recipe associates scallops with a traditional leek fondue. The pistachio powder will give a tasty and colorful touch to this delicious verrine. Again this verrine is easy to make and will procure full satisfaction to your guests during your dinner. Wash and chop leeks. Slice onions. Open the pistachio nuts and chop finely with an electric mixer. Reserve. Melt 10 gr. of butter in a non sticky pan. Add leek and onions and season with salt and pepper. Leave to cook on medium/low heat until leeks are cooked. Monitor cooking process and reserve. Melt 5 gr. of butter in another non sticky pan. Cook scallops for 1 minute on each side. 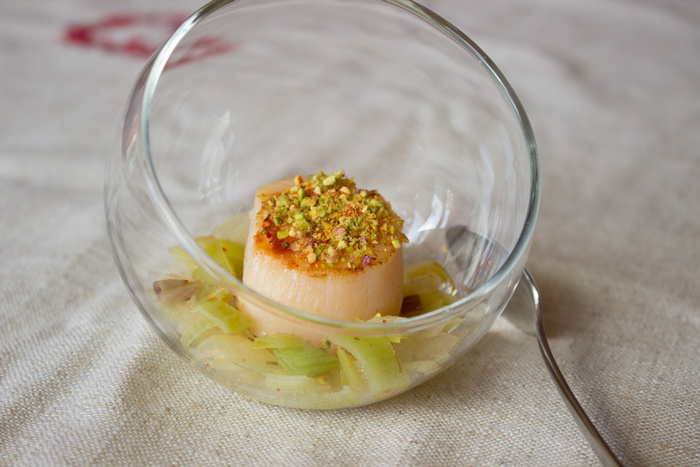 Place first a layer of leek fondue in your verrines, then put one scallop and spread some pistachio powder and espelette pepper on top of each scallop. If you like scallops, you might be interested by the Scallops and Carrot verrine, an exotic Bento: Avocado, shrimps and Scallops Salad and Scallops flambéed with Brandy. To find more verrine recipes, you can visit the verrine recipe index and if you enjoyed the recipe you can share it with your friends on the social media.